Anyway, one of my readers – a talented cartoonist named Dan Roth – has published a cartoon based upon *wolfshades*. I’ve been a fan of his for quite some time, and his comic strip is in my blogroll – Sheep Laughs. Once you’ve seen that one, take a look through his archives. It’s a fun trip! I noticed that comic strip in your sidebar a couple weeks ago I think, very funny stuff. “Ewe are fierce”, hahaha. Such an interesting take on the wolf-sheep cultural dynamic too – like the concept of having a discussion with your next meal. I almost never argue with my broccoli. Thanks for the feature and kind words. My webcomic enjoyed a record number of hits today. 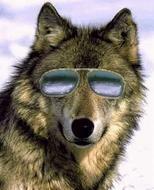 Just goes to show you how cool wolves really are. Glad I could help contribute to your readership Dan. I honestly am puzzled as to why you’re not already in syndication all over the place. :) Your work certainly deserves it.